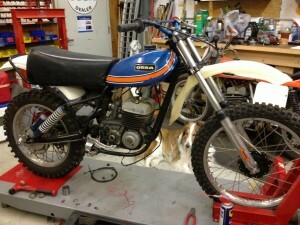 I’ve been looking for a 76 GP2 Motocrosser for the last 5 years. Warren Clendenny put his project up for sale at the right time, so I snagged it! The bike had an incorrect 180 series motor mounted, which I will use in another project. Fortunately, Joe Bilazzo had the correct engine, a 460 series, so Alex made a deal on that! The exhaust pipe was included, but I later found it had been “cobbed up” to fit a smaller cylinder – check out the pics – a lot of fitting and welding. When I picked it up at Snoop’s shop, we saw that the front brake backing plate was broken. As it turned out, the axle and hub were bent and the fork leg was damaged – all needed replacement! But it’s beautiful now – one of OSSA’s best looking bikes! I’m very tickled to have one in the house.